Be sure to click on the History Tab to visit our history page for photos and stories of our fire district. I remember this picture. My dad is holding the dog. 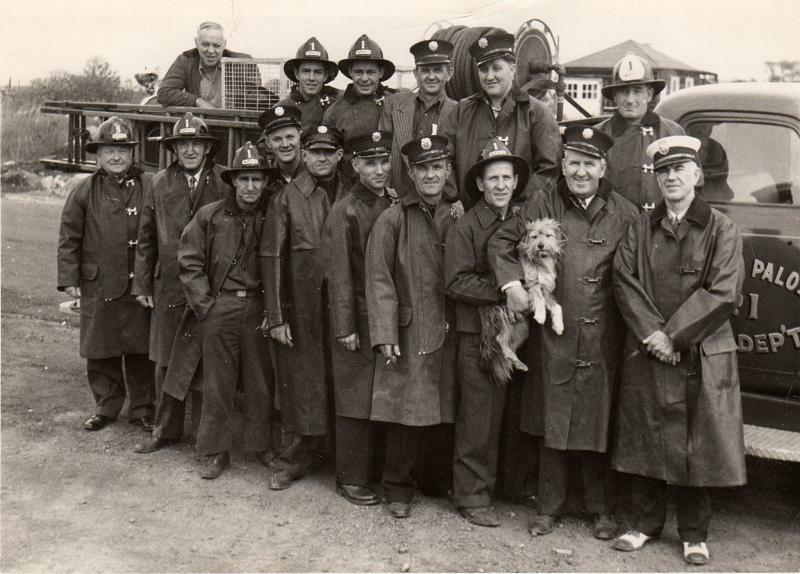 The man next to him I believe is Bill Smith"Smitty" Smitty (he has his arm around the dog)lived across the street from the fire house where it stands now. The big white house, next to it stood his restaurant "Smitty's" aka the greasy spoon. The coats they are wearing were made of rubber, yes they would melt and were very heavy. I spent my entire childhood there until I was in my 30's. My dad would take me there show me the equipment, how things worked. Each fireman had to maintain the equipment, being a volunteer department at the time. We lived 2 blocks from the fire house. A few times my dad would run down the alley to the station with our dog following him.